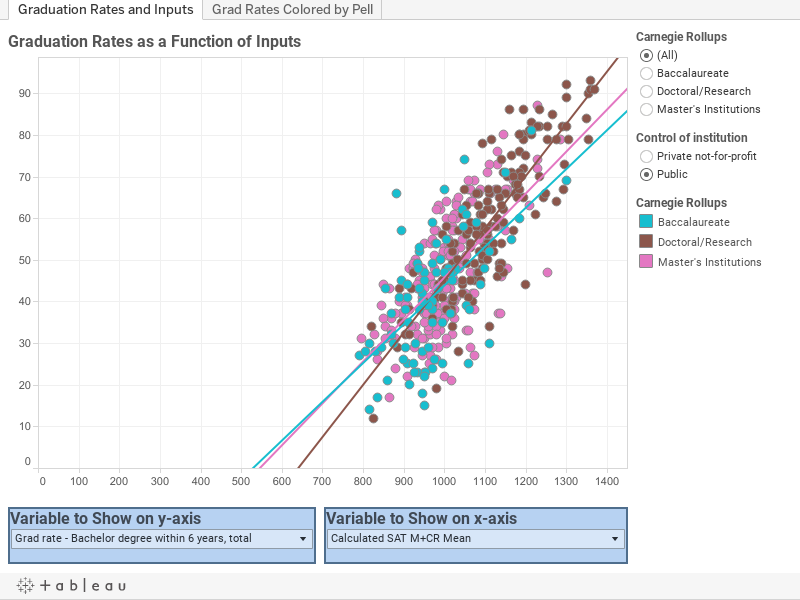 Higher Ed Data Stories: Are Graduation Rates an Input or an Output? Are Graduation Rates an Input or an Output? It seems obvious: Students come in, and students go out. The type of students who enter your university are measured on lots of things, like test scores, GPA, ethnicity, and parental income, to name just a few. Universities are measured too, on lots of those same things, as well as others, including the graduation rate. Lots of people think the graduation rate is a function of what the university does or does not do, and in some sense, of course, they are correct: If you don't care about your students, or their progress, or you're not challenging their minds, they may leave. Take a look at the interactive graph below, and see how strongly certain input characteristics are associated with graduation outputs. What do you think? You might also want to look at research from HERI at UCLA, especially the table on the bottom of page 23 in this publication.